In my last blog, I reflected on the shift in what has become unacceptable in our society, or in the human community at large. When we contemplate social injustice, we no longer accept it as “just the way things are”; instead we feel angry or motivated to do something. When we hear about abuses of human rights, or of nature, we are outraged and on many occasions, take action or voice our concern. In the few weeks since I wrote that blog something extraordinary happened. Greta Thunberg, the Swedish teenager I mentioned because of her protests against climate inaction by world leaders, invited children to join her protest on Friday, March 15. 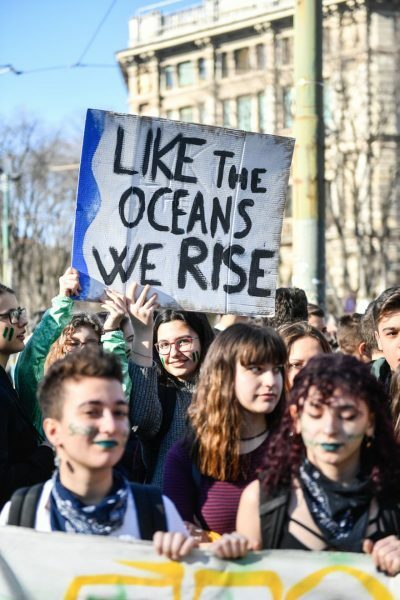 Social media and the FridaysforFuture movement, started by Greta, rapidly reached around the world. A few days before the event, the prospects were optimistic: thousands of children in dozens of countries would participate, in some nine hundred ‘school strikes’. Over 2000 protests took place, by over one million students in 123 countries. They took to the streets with their self-crafted signs and voices. With creativity and inspired by the straight- speaking Greta Thunberg, they raised questions and demands. 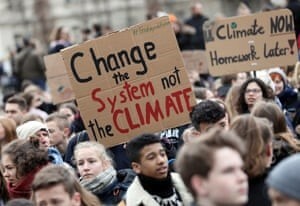 The logic and challenge of their signs was powerful: “Denial is not a policy”, “Our planet is changing, why aren’t we?”; “I’m missing the science class for this”; ”Change the system, not the climate”, “It’s not us the utopians”; “Climate has a grimmer outlook than my high school diploma”; “There is more plastic than common sense”. Greta has a stern and unemotional discourse. She is like the child in the story of the Emperor’s clothes who candidly said what everyone else deliberately ignored. She didn’t hesitate to confront world leaders at COP24, the international UN Convention for Climate Action, stating, “you are not sufficiently mature to say things as they are”. Or at the World Economic Forum at Davos where she claimed that “Some people, some companies, some decision-makers in particular, have known exactly what priceless values they have been sacrificing to continue making unimaginable amounts of money. And I think many of you here today belong to that group of people”. The ripple effects are swift and unforeseen. The Belgian Minister for the Environment had to resign because she falsely stated the protests were not acts of spontaneous solidarity, but merely a confirmed organized conspiracy. Jean-Claude Juncker, Chief Executive of the European Union, announced that a quarter of EU’s Budget will be invested to mitigate climate change, a multi-billion new commitment. And a few hours into the March 15 protests, Antonio Guterres, Secretary General of the United Nations made an announcement: “These schoolchildren have grasped something that seems to elude many of their elders. […] I am bringing world leaders together at a climate action summit”. He is calling them to come to New York in September “with concrete, realistic plans to enhance their nationally determined contributions by 2020, in line with reducing greenhouse gas emissions by 45% over the next decade, and to net zero by 2050”. I wonder about what reaction the parents of these schoolchildren might have. What might they feel as they come back from work and hear their daughter describe her amazing experience? How will they reflect on their own contribution to the problems their son is now castigating? How will the businessman react in his office Monday morning, with the passion of his young son still in his ears? What is the unspoken call to action the slow generation of parents will hear loud, screaming in their own hearts? What will the neighbours, the best friend of these students, the relatives, the school teachers think? “We are bunking to educate adults”, read the sign of a little Indian girl in Delhi—meaning she was playing hookey to educate the grownups. And I was reflecting on this resistance and on the consequent challenge educators face of embedding a sustainability lens into every single subject taught in higher education, in business schools, engineering, or IT. I found myself questioning the speed with which deans, endowment managers, university presidents, seasoned faculty and ranking crafters are responding to a reality we face every day. A reality that we try to push aside because we are too busy doing what we planned to do. We have been talking about “the next generation”, the future generations. Well, on March 15 I realized there is no next generation, they are here. They are watching and talking to us. They are already ‘woke’, and will be enrolling in our colleges in one year or two. Perhaps their siblings are already in our universities and are ready to act on their new awareness. How are we educators preparing our kids to take the actions they seem ready to take? What of our current subjects is actually deepening the crisis we are in, by playing into the old school rules of the economic game? It reminded me of the story of the Pied Piper of Hamelin. The citizens of that town made a promise to pay him for getting rid of the rats, and the promise was not honoured. So he came back and took all the children. The Paris Agreement promise is not being maintained, and our children just walked out into the streets. “You give me hope”, Secretary General Antonio Guterres said. Me too. I think this time we will get it. And if for a moment we think the voices of the children will fade away, read their promise: “Like the oceans, we rise”.